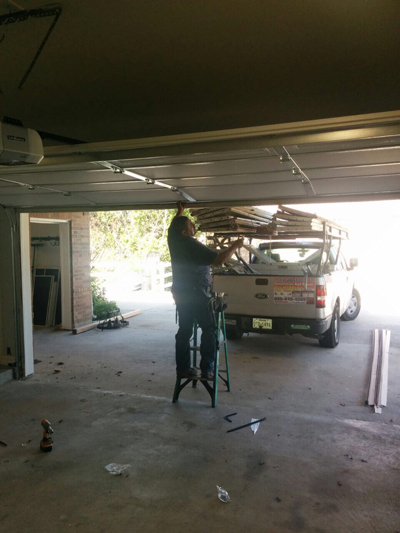 The level of garage door repair difficulty is different every time but you must make a note that even in cases where the task is relatively easy, extreme attention is required for the avoidance of accidents. Since hinges hold the panels of sectional doors together, their replacement seems to be extremely hard. This is not always the case but it would depend on the overall condition of the door and how careful one is when having the hinges replaced. For example, if you remove more than one hinge together, you would probably have trouble and jeopardize your safety. The door must stay stable as you are working and by removing two hinges together, you just provoke your luck. There are several hinges on each overhead door since apart from the central ones, which serve to hold panels together, there are also side ones. These ones are supporting hinges which connect the door to the rollers. Many times, the replacement of the hinges is combined with the replacement of the garage door rollers. In order to replace the old hinges you would have to remove the rollers anyway so this is a good chance to replace both parts if they are worn to avoid repeating the task two months later. Hinges are fastened against the door with either bolts or screws. In either case, they would have to be removed so that the hinge can be removed and be replaced. It's always good to keep the instructions close to you because hinges must be installed in a certain way. The hinges, which hold the rollers, have a special roller hole where the wheel is inserted before placed back in the garage door track. It's also important to use the right size hinges as well as their bolts or screws for greater door stability. If you need to replace the rollers as well, remove the center hinges one at a time by unscrewing the screws. Make sure the new hinge is identical to the old one so that the holes will match. Insert the new roller in the right hole, put the roller back in the track and once you are sure the new hinge is in the right position, tighten it. Don't over tighten the hinges or the door won't move as well. Remember that the upper side hinges do not have screws but bolts. You must remove the nut in order to remove the bolt and then remove the hinge along with the roller. You will need to bend the track first so that the roller would come off easier but you must remember to straighten it out well once the replacement of the roller and the hinge is completed. Although hinges are not expensive neither their replacement extremely hard, it's best if you can avoid having such tasks often. If you take great care of the hinges, they will last longer. You only need to remember to tighten their screws or nuts and lubricate them. Lubrication maintenance is vital and you must put oil at all seams. When it comes to hinge replacement, nothing can go wrong unless you remove all hinges together. In this case, the door will fall. It's always best to keep your distance from such repairs even if they are not very hard and you can always count on Garage Door Repair Otsego for repairs and consultation. Hinges might be small in size but essential garage door parts. From the selection of the right ones to their replacement and repairs, every step is of enormous importance.